In 1973, NBC-TV aired the TOPPER RETURNS TV Show in an effort to bring some Thorne Smith magic back to the small screen. 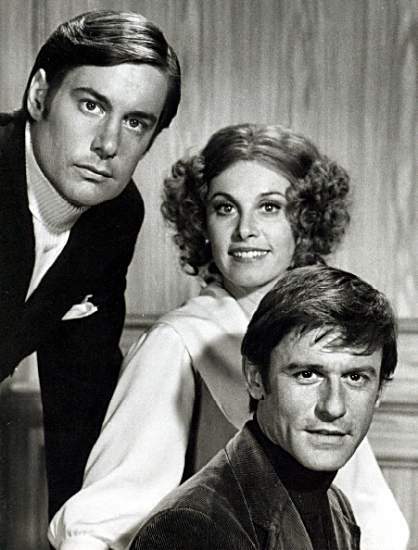 Starring Roddy McDowall, Stefanie Powers, John Fink and Reginald Owens, the pilot aired on March 19, 1973. Unfortunately, the show wasn't picked up and the talented cast moved on to other things, with McDowall eventually landing back on the Planet of the Apes in the 1974 television series derived from the successful Apes films. Roddy played Cosmo Topper Jr, nephew of the deceased Cosmo Topper, who winds up having his life turned upside down when he inherits his uncle's possessions, which include the ethereal George & Marion Kerby (played by John Fink and Stefanie Powers). Reginald Owen played Jones, the butler to Cosmo Topper. John Randolph, Jeanne Bates, Ed Peck, Art Lewis, Ralph Manza and Amzie Strickland also appeared in the show. Hy Averback was the director while AJ Carothers is credited as the writer. Sadly, TOPPER RETURNS was the last acting appearance made by Reginald Owen, a character actor who appeared in numerous television shows and films. (According to fellow Thorne Smith fan, Kevin S. Butler, NBC aired the pilot in 1974. Kevin is the only person I know of who actually remembers seeing the show. The date I've cited in March of 1973 comes from a variety of sources. In the photo above the text states the show is airing along with two other shows, one of which was called "Going Places". Researching that show also brought me another instance of the March 19, 1973 air date. Both photos courtesy of our generous and helpful friends at xmoppet.org, which is a wonderful tribute site dedicated to the memory of Roddy McDowall. Stefanie Powers wrote her autobiography, which was published in 2010 by Gallery Books. Of course, she is best known for her work on the TV series "Hart To Hart" with Robert Wagner.